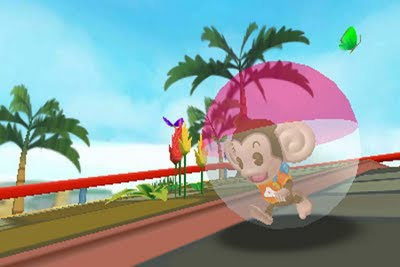 Ten years ago the Super Monkey Ball franchise rolled its way onto the Nintendo GameCube and kick-started a craze that has spawned about fifteen sequels/spin-offs, and at least as many monkey mini-games. In Super Monkey Ball 3D our furry cast of primates are back, and for the first time ever in rich 3D that takes full advantage the capabilities of the Nintendo 3DS. You might think this would be a great idea, and it is, but there's a catch. Let's start off by addressing the elephant (err...monkey) in the room. For those uninitiated, the premise behind Super Monkey Ball is to roll your monkey through single-level obstacle courses by tilting and rotating the game world. A couple of years ago Sega released a version for the iPhone that utilized the device's accelerometer﻿, allowing players to physically tilt their iPhone to rotate the game world. It was a fresh spin on the franchise and controlling your monkey on the 2D screen was simple and satisfying. The major issue with the Nintendo 3DS version is that Sega decided to implement a similar gyroscope control scheme on a portable device that we all know has a rather narrow "sweet spot" of vision. The result is a blurry mess as you tilt and lose focus constantly as you play. Thankfully, the game also has a Circle Pad control set-up and that's really the way to go here. In fact, using the Circle Pad makes this quite possibly the most controllable Super Monkey Ball game yet, given the comfortable feel and great sensitivity of the analog control nub. I found even the most nuanced twists and turns of the Circle Pad resulted in precise tilting onscreen exactly as you'd expect it to be. This meant that every fall off the course felt "fair" and could be attributed to control errors such as over steering﻿ or too much speed. 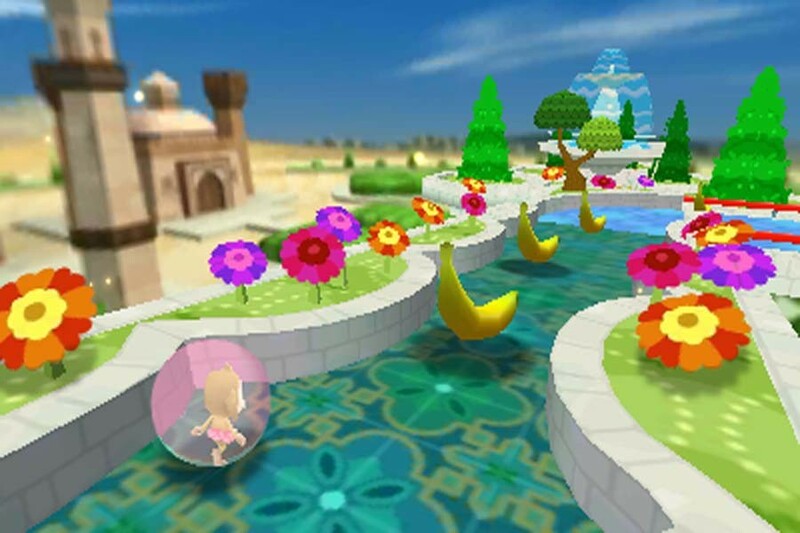 Whereas other Super Monkey Ball games contained a dozen or more mini games to play, this version only contains three: Monkey Ball, Monkey Race, and Monkey Fight. The latter two mini games feel like Mario Kart and Super Smash Bros. clones, and unfortunately neither one comes close to matching the bar set by Nintendo. It either goes to show how uninspired these two mini games are, or how superb Nintendo's games are. No matter how you slice it, the only real game worth playing here is the tried-and-true Monkey Ball. With over 70 levels to play, Monkey Ball offers a decent amount of gameplay time (around 2-3 hours) and of course you'll likely want to replay levels to improve your score. At the end of each level you'll be graded on your performance, including how much of the 60 seconds you've used up, and your score is cumulative so long as you don't lose all your monkey lives. Collecting thirty bananas which are scattered around the stages will net you another monkey and another chance to redeem yourself should a slip off the game world occur. There are some new hazards introduced in this version such as pesky bumpers that ricochet your monkey off the nearest ledge, and sand patches the slow your roll to a crawl. 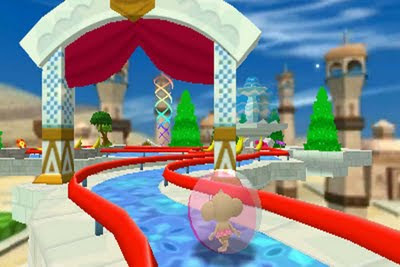 The 3D effects in the game are occasionally extremely impressive, such as the beginning of each World which has a cool pop-up book style intro or the 360 degree zooming camera spin at the start of each level which shows clear depth between the suspended platforms and the background. During gameplay itself the 3D looks okay, but it does sometimes get out of focus. In order to remedy this, it's best to turn down the 3D to the half-way mark or below which brings the action into much greater focus. While Super Monkey Ball has been done time and again, this is the first time in full 3D and it seems Aiai and the rest of his monkey crew have a respectable, if not serviceable first outing. If you're a long-time fan of the series the Monkey Ball mini game will give you enough entertainment to pass some time, but ultimately this seems like a paired-down game compared to Super Monkey Ball games already out there in the market.